Michelin announced that the U.S. Green Building Council has awarded the Leadership in Energy and Environmental Design (LEED) Gold certification for the Company’s vast Midwest Distribution Center in Wilmington, Ill.
Michelin's Distribution Center in Wilmington, Ill., pictured here, has received a Gold LEED certification. The LEED Green Building Rating System is recognized as a benchmark for the design and construction of high-performing buildings that meet certain important green building standards. “Together, the team working on this project was able to find opportunities at the early stages of design for sustainability and efficiency and implement them by employing a creative approach to the facility’s construction,” said Pete Selleck, chairman and president, Michelin North America, Inc. 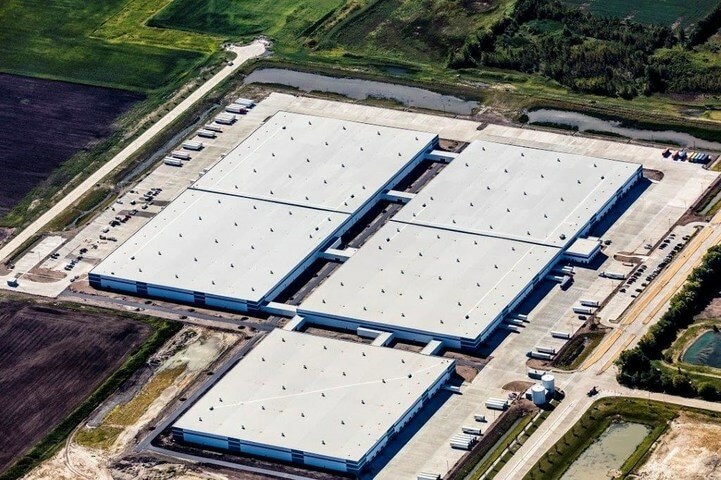 The Michelin distribution center, which roughly comprises the size of 30 football fields, is a single-story warehouse that serves Michelin customers in the Midwest region. The center is the largest warehouse in the RidgePort Logistics Center in Wilmington. Optimized energy performance — The facility is projected to be 59 percent above a baseline energy model, with interior and exterior LED lighting contributing to much of the energy savings. Minimizing ozone depletion — Michelin’s heating and cooling systems in the facility do not use CFC-based refrigerants, HCFCs or halons. Construction waste management — More than 92 percent of the building’s construction debris was diverted from local landfills and recycled into new products. Water use reduction — The Michelin warehouse is able to achieve significant water savings through the installation of efficient plumbing fixtures for the toilets, showers and all sink faucets, all of which saves 44 percent of the facility’s water when compared to the LEEDv3 water baseline. In addition, native and adaptive plants were selected for the outside landscaping, which eliminated the need for a permanent irrigation system. Recycled content — Post-consumer and pre-consumer products and material represent 30 percent of the cost of products used to construct the site. Examples of these materials included steel, concrete, drywall, carpet, doors and insulation. Green power — 35 percent of the building’s projected energy use for at least the next two years will come from renewable sources. Alternative transportation — In a concerted effort to promote and encourage the use of bikes and low-emitting and fuel-efficient vehicles, Michelin and its builders reserved bike storage for 5 percent of the staff and visitors, and provided reserved parking spots for qualifying fuel saving cars.